Analytical software allows you to see exactly how people are finding your website, and which search terms they are using. I just noticed a repeated search phrase being used "can I access invoice finance with CCJs?". It would make sense as you are most likely to need funding support if you are under creditor pressure and you have ended up being taken to court by a supplier. A CCJ is a "County Court Judgement", a type of court order that can be registered against you, or your business, if you fail to pay a creditor. It can stay on your credit record for six years. There are various ways that a creditor can enforce such a judgement e.g. instructing a bailiff to seize goods that can be sold to pay off your debt. Returning to the question of accessing invoice finance (IF) with CCJs, the answer to that question is likely to be "Yes". 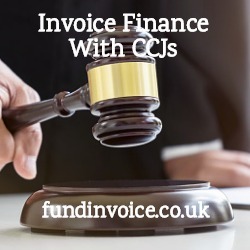 To an extent it will depend upon the circumstances of the CCJs but providing there is a reasonable explanation, some invoice finance companies (but not all) are willing to over overlook them and provide you with business funding despite having judgements. The feature of IF that makes this possible is that the funding is secured on the value of your book debts (what your customers owe you), rather than the credit standing of your company, as a loan or overdraft would be. This allows some funders to take a more liberal where there is a previous poor credit history. The most important distinction is likely to be identifying that they company was experiencing cash flow problems that can be solved with further funding, rather than having deliberately not having paid their debts, or having committed a fraud. Article: Business Finance With Bad Credit - we look at some of the tips people give to improve your business credit score, and a simple alternative to jump to the end goal and raise money for your company now. Case study: Funding A Roofing Contractor With CCJs - a case study demonstrating that when a roofing contractor was declined funding due to CCJs, there were still alternative options available to them. Article: Avoiding Insolvency - even if creditor pressure is rising and you are facing insolvency, there may be options to release sufficient funding to get your business back on its feet. Case study: Problems Accessing Finance With Defaults - another example of how different funders will take different views of a client's situation. Where one funder turns a deal down due to defaults and non home ownership, another funder is prepared to lend. Our free guide to invoice finance.